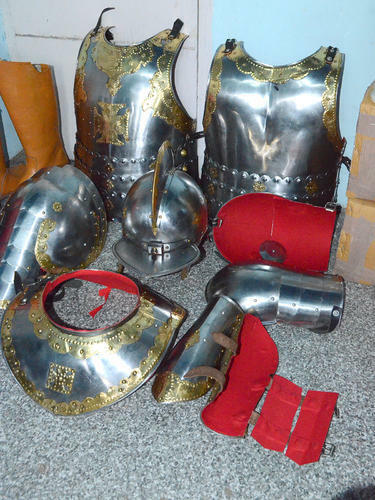 We have a huge collection of intricately designed array of Medieval Armour. Incorporated as a Sole Proprietorship firm, we “Ancient Handicrafts” located at Meerut (Uttar Pradesh, India) have gained recognition in the field of manufacturing,trading and exporting a remarkable assortment of Ancient Helmets, Medieval Armors, Body Armour, Greek Medieval, Roman Medieval Helmets, Chainmail Armours, Leather Helmets, Caps And Uniforms, Battle Ready, etc. Under the headship of “Mr. Manish Pathak”, we have gained a strong foothold in the market.We export our products to all over the world.We also provide maintenance service to our products.